In 2012, leaders of HOPE SF examined data across schools, city agencies, and the housing authority in San Francisco. The data match revealed that a whopping 53 percent of students living in public housing complexes were chronically absent. Improving student attendance quickly became a top priority for the initiative education strategy. 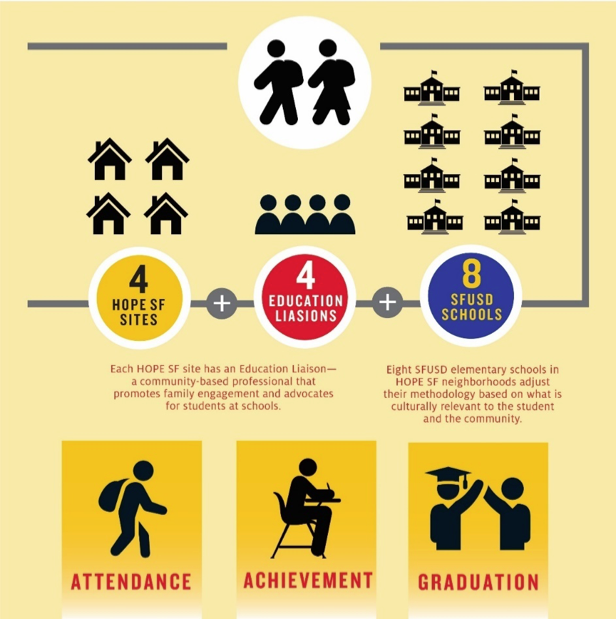 Hope SF began by sharing this data with their partners, both residents and agency representatives, and together they developed a set of strategies that has brought the community closer to the schools. The chronic absence rate in the complexes dropped 14 percent — from 53 percent in 2010-11 to 39 percent in 2015 — indicating the initiative’s success. HOPE SF is a cross-sector initiative dedicated to improving four of San Francisco’s most distressed public housing complexes without large-scale displacement of current residents. Nearly 5,000 individuals live in the four complexes, and the majority are young, poorly educated and unemployed. Situated within the city limits of thriving San Francisco, HOPE SF represents racially segregated communities of concentrated poverty within a city of unprecedented prosperity and innovation. A cohort of eight elementary schools, serving large numbers of children from the four housing sites, has been identified for additional support. HOPE SF equips school staff and education liaisons to work as teams to engage parents, message the importance of attendance and address the needs of chronically absent students. Data provided by the district informs the work. All four HOPE SF housing developments have education liaisons, who live in the community and are hired through the neighborhood-based Family Resource Centers. Education liaisons know both the school system and the community. They know the families and the environment they live in. They understand their challenges, help bridge relationships and advocate for students. Resident leadership is valued across the initiative. At Potrero, one of the four HOPE SF sites, Bridge Housing (the non-profit housing developer which has embraced the concept of Trauma Informed Community Building), and the Healthy Generations Project help families understand and address the impact of trauma and toxic stress on their lives. HOPE SF has also begun to explore the concept of hiring parents, who live in public housing, to serve as peer advocates. These peer advocates receive training with the first goal being to understand their own needs and challenges. Peer advocates also establish their own goals, such as attend parent-teacher conferences or maintain 90 percent attendance for their student, in order to become role models for others. Lift up the voice of resident leaders and grassroots community partners. Apply trauma-informed approaches, recognizing that the current system may be escalating experiences of toxic stress and trauma. Take a racial equity lens, disaggregating data by race and place to identify the factors that influence outcomes for a given demographic. Support innovation and continuous learning by tying efforts to performance measures and short- and longer-term outcomes. The work is beginning to yield results. Initiative partners note that chronic absence has become an accepted population level indicator across all sectors, not just education. The Education Liaison program is a huge success, as families, schools and the district see it as a useful resource. And the 14 percent decrease in chronic absence rates from 2010-11 to 2015 shows the program is working. This work continues to unfold and evolve. While the initial progress is promising, many challenges remain, including determining how to best integrate and institutionalize this education strategy—currently supported as a pilot—with other components of this complex initiative to ensure long-term sustainability. Check out the walking school bus slide show. You can find out more at the Hope SF website.